With his collaborative album with Balázs Pándi and Mats Gustafsson just released, Joseph Burnett catches up with the enigmatic Japanese noise legend to discuss the making of the album, the modern noise scene and his remarkably prolific output. For over thirty years, Merzbow (aka Masami Akita) has been the biggest and most recognisable figure on the international noise scene. Indeed, he has defined the contours and aesthetic of the genre, from his pioneering use of tape loops to create hulking industrial vistas in the late 70s, to his switch to laptop-generated static noise at the turn of the century. A cluster of harsh noise releases in the 90s, meanwhile, produced masterpieces such as Venereology, Pulse Demon, 1930and the jazz-inflected Door Open at 8am. 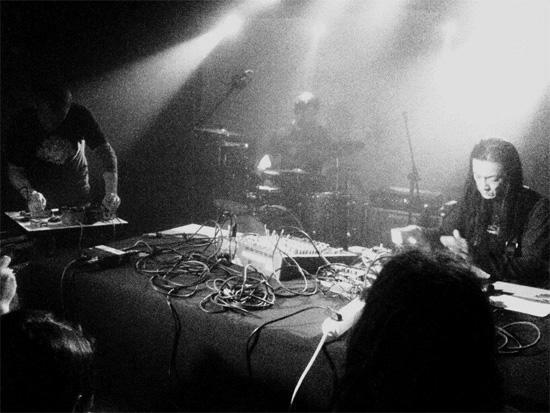 Rightly hailed by Paul Hegarty, in his seminal book Noise/Music, as an artist who reached the apex of noise’s potential as an artistic genre, Merzbow has been a clear influence on a wealth of subsequent noise artists and groups, from compatriots Hijokaidan and Incapacitants to Western acts like Wolf Eyes, Vomir and The Rita. He has also collaborated frequently with other artists, from underground figures such as Nordvargr and Richard Ramirez to international stars like Genesis P-Orridge, Richard Pinhas and Sonic Youth. Ever prolific, Akita has released a glut of albums in recent years, notably his 13 Japanese Birdsseries, which highlighted his ongoing ecological and vegetarian activism, and last month released a stirring collaborative album, Cuts, with frequent collaborator Balázs Pándi on drums and ever-enthusiastic free-jazz saxophonist Mats Gustafsson. The Quietus caught up with Merzbow to discuss the album via e-mail, and to get the great man’s thoughts on working with other artists versus recording solo, the modern noise scene and his remarkable output. Merzbow: Balázs and I started working together around 2009. We toured Europe and America. We came up with the idea of playing with Mats when we were touring Europe in 2011. It was Balázs’s idea to make this trio. I’ve known Mats for some time, as we also played together several times, so I had no problem playing with him. Cuts was recorded in a studio, the day after we played in Budapest. How did the recording process work? Were the tracks recorded live and improvised, or did you work to a pre-arranged structure? M: We recorded several improvised sessions at the studio there, and I brought the music back to Tokyo and edited it. I didn’t change the structure of the tunes so much. As far as overdubs go, there is only one sax part transferred to another place, but that’s it. My edited version was sent back to Budapest, and Balázs re-edited it. Was it tricky finding the time to record with Mats and Balázs, given geographical differences and busy schedules? M: Oh, you know, the drummer was Balázs then. I started working on the production with a drum sound around late 2008. I was originally a drummer, but I have rarely used drums on Merzbow recordings. So, I thought of this as a new attempt. On the Japanese Bird series, a series of 13 albums, I played drums on almost every tune. Maybe it was only natural that I was invited and started playing with Balázs. Of course, he is a much more powerful and technical drummer than me. His drumming is connected to metal, grindcore [and] free jazz, so it is very easy to play with him. I saw you perform in London a couple of years ago, also with a drummer. Do you have to change your approach to your music when working with other musicians? M: As far as gear, I use the same thing, with more oscillator use than usual setups. Mats used a circuit-bending effector a lot. Mats knows how to do noise business really well. You record regularly with different artists, from Richard Pinhas to Boris. Does collaborating throw up different challenges to performing solo? M: Solo live is harder, there are many more things to work on. I need to prepare the structure, what to do with rhythms, etc. Improvisation plays a very, very small part in my solo shows. On the other hand, I don’t have to think about anything except my own part when working in a collaboration, so I can focus more. Mats, of course, is known for his free jazz work, and there’s a jazzy side to Balázs’ drumming. Are you a fan of jazz? I believe Door Open at 8am was inspired by jazz drummers – do you think there is even an element of jazz tradition in your solo recordings? M: In the late 70s, I was playing the drums in an improvisation unit. Back then, I was strongly influenced by European free music, such as ICP, FMP and INCUS. Also, I remember listening to ESP DISK, BYG, Sun Ra and other free jazz albums a lot. I don’t really understand jazz musically, because I come from rock music. I discovered Coltrane through listening to Frank Zappa and Soft Machine, those kind of things. Of all the major noise figures, your music seems to me to work around notions of rhythm. Would you agree? Is it important, even in noise music, to build up a level of forward momentum? M: On some pieces, I put emphasis on rhythm, and some others I don’t… I haven’t really met head-on with rhythm until now. My music should stay very distinctive from “beat music”. So, in my case, if I produce a piece with heavy rhythm, the next one I’d come up with would be a piece with no rhythm, it will be different by the circumstances of the moment. I use rhythms and loops on the stage nowadays, but in my studio production many of the pieces are constructed without rhythm parts. Lately, I kind of like to use processed polyrhythmic tracks, polyrhythm, such as the Latin percussion rhythm on 60s Miles or Marion Brown’s Geechee Collection, which I put in the background of pieces using the Granular Synthesis program. Could you give me a bit of background on the album title, Cuts, and track titles? Titles like ‘Evil Knives. Lines.’ or ‘Like Razor Blades in the Dark’ suggest quite violent imagery… Was there a concept or central idea behind these titles, and the album itself? I notice the cover art features a bird, and you released a series of albums based on birds. What do birds represent for you? M: I am a Vegan, Straight Edge Animal Rights. So, I like the image of the bird. I like chickens and pigeons the most but crows are good too. The cover art image was created by a friend of Balázs. I really like it. The three of you certainly sound very tight as a trio. Would you consider recording in this set-up again in future, or would you say this is going to be a one-off? Do you have any plans to tour with Mats and Balázs? M: I would definitely like to play with this trio again, but we have to work on the scheduling. It is rather difficult to find the time for all of us to be available. We are working on a tour of Japan in October right now. You also took care of the mixing of the album. Was that a difficult process? Do you gain as much pleasure from mixing as you do from performing? How did you decide which elements to prioritise or enhance in the mix, if at all? M: I’ve always mixed my music by myself. Of course, there will always be some complications here and there, but it’s never a problem. You yourself are as prolific as ever. I count at least eight solo records in the last year. Is it a challenge for you to keep this inspiration flowing, or does it come naturally? Do you record everything you perform? M: For me, creating music is a completely natural thing. I’ve been doing so, and I will continue doing so. I record almost everything I play at home. I don’t record live by myself because live is kind of… a routine. Are you aware of the current noise scene, which you have obviously influenced quite a lot? Are there noise artists that you feel a particular affinity for? M: I don’t really know anything about the current noise scene. I always pay attention to the the extreme metal scene though. I recently worked with MB (Maurizio Bianchi). I have known him since 1980 but it was my first time to collaborate and work on music with him. 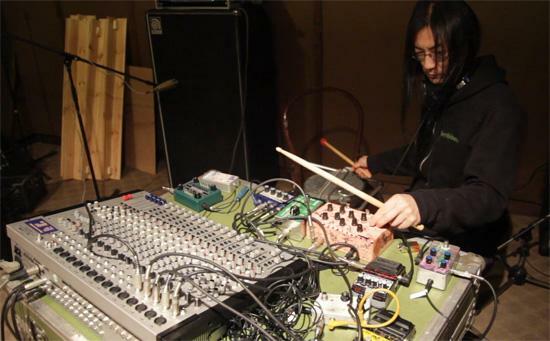 Will we be seeing more Merzbow releases in 2013? Will people in the UK be lucky enough to see you perform, solo or with others? M: My new album devoted to birds in New Zealand will be released very soon in the States. I am currently recording music for Animal Rights, a three way split – production is going on in Norway. I’m working on a 3 CD set which will be produced in Hong Kong. Some albums done live in Australia are set to come out, including a duo with Oren Ambarchi. A Grindcore project called MERZGRIND with Balázs is also happening, and we have signed to Relapse. Other than that, I have shows in Taiwan in July, the States in September, and New Zealand in November.